Electronic ID Systems: Can They Pay for Small-Scale Livestock Producers? 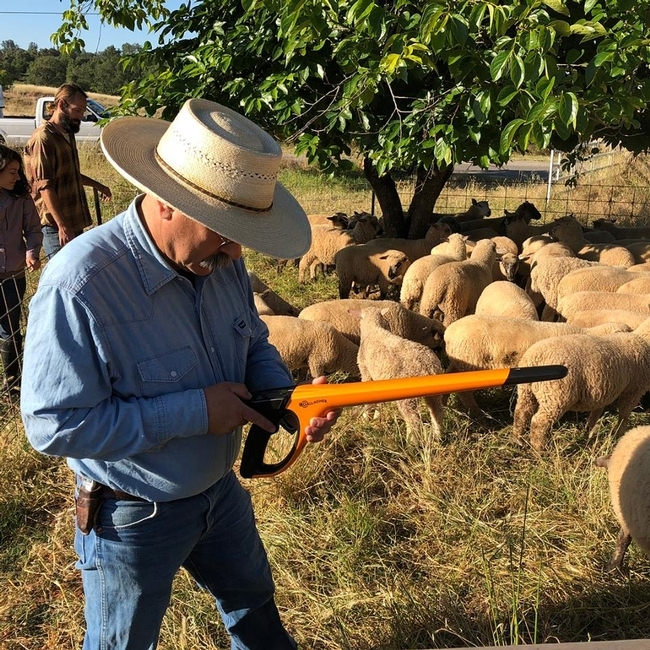 Electronic identification (EID) systems for livestock provide a number of potential advantages for producers, and new technology is making these systems more affordable. From an animal management and recordkeeping perspective, EID systems make tracking genetics, animal performance, and animal health easier and more robust. From a product perspective, EID systems can facilitate greater feedback on product quality from processors, as well as improved trace-back capabilities. But EID systems can be expensive. This post will help small-scale livestock producers consider the benefits and costs of adopting EID technology. In my sheep operation, our previous record-keeping and animal identification system evolved over a number of years. Our ID system developed to facilitate the kinds of records we needed to make management decisions, track production, and market our lambs. At lambing, each lamb received a small, brass ear tag. Rams and terminal lambs were tagged in the right ear. Potential replacement ewe lambs were tagged in the left ear. Down the road, this system allowed for a quick visual cue for sorting sheep. At lambing, we kept a handwritten journal, in which we recorded birth date, dam ID, birth type (single, twin, etc. ), breeding group, and EZ Care score (the EZ Care score is used to evaluate ewes as well as potential replacement ewe lambs). These handwritten records were transferred to an Excel spreadsheet every evening during lambing. During this time, we noted any ewes that needed to be culled for reproductive or maternal reasons. At weaning, we put visual identification tags (free USDA scrapie tags) in each lamb after we separated lambs from ewes. We hand recorded each tag number, matching with the brass lamb tag number. If a ewe lamb was going to be retained, we put a colored ear tag (associated with her breeding group) with the year of her birth in her other ear. We also hand-recorded the body condition score for each ewe. Since the tagging process could be somewhat lengthy (because we had to read each lamb tag), we generally brought the lambs back in a day or two later to give their weaning vaccinations. During the course of the year, if we treated an individual animal with antibiotics or dewormer, we recorded her (or his) ear tag number in an online journal (using Facebook and Google Calendar), noting the appropriate withdrawal period. At shearing, flushing, breeding and pre-lambing vaccinations, we checked animals against an inventory list. While we never kept track, I suspect we have had a tag loss rate of about 3 percent per year. If we couldn't read the ewe's old lambing tag, we lost the data associated with her old number. Finally, we collected individual body condition scores on a handwritten list at weaning, flushing and breeding. When we marketed our lambs, we tried to remember to write down ear tag numbers. If we were direct marketing lambs with the help of Superior Farms, we would send processing instructions for each group by paint mark – red marks processed one way; blue marks another (for example). We sometimes received lot yield information from Superior Farms (mostly carcass weight and sometimes yield grade). Even though our system wasn't perfect, it seemed to work. By keeping close track of the maternal traits measured in our EZ Care lambing system, we improved maternal ability and reduced lambing labor. We were able to track vaccinations and medications and ensure appropriate withdrawal times. Our Excel records seem to provide the management data we need for decision making purposes. So why change? In 2017, USDA announced that it would no longer provide plastic scrapie tags for free. Being extremely frugal (okay, cheap! ), I decided to look for other alternatives. Replicating our current system (brass lamb tag, scrapie tag and colored breeding group tag) would cost approximately $2.13 per head (not including lost tags). We started to evaluate other options. Shearwell Data, a company from the UK, announced that its EID tags were approved for the USDA Scrapie Eradication Program. As we looked into this option further, we discovered that these tags were reasonably priced ($1.03/tag in the quantities we needed). They came in different colors (which would allow us to use them for visually sorting our breeding groups), and they had a 99 percent retention rate (better than our old tags). This year at weaning, we started using Shearwell tags. The decision to move to EID tags doesn't end with the purchase of the tags, however; we also needed to buy a reader. 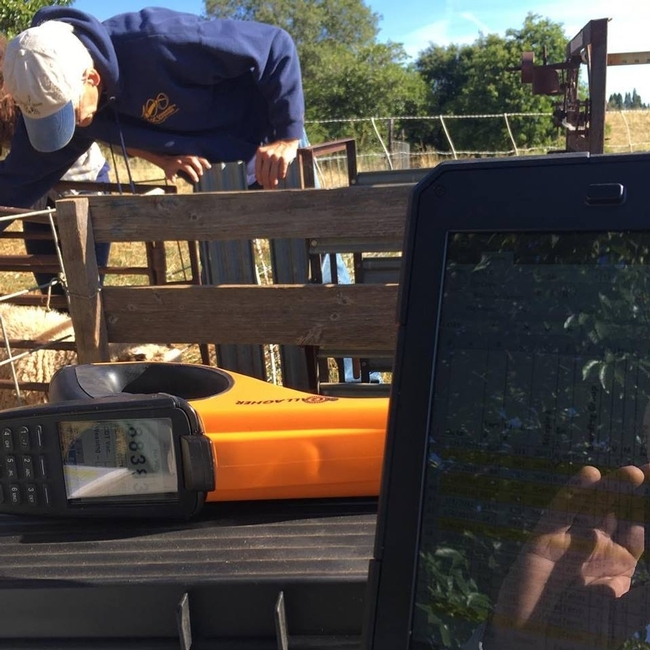 Several years ago, while working for a large-scale sheep outfit in Rio Vista, I used a Shearwell reader (which looked much like the scanners that UPS drivers use to track packages). The scanner worked reasonably well once it was set up to record the data we needed. Unfortunately, because tech support was in the UK, getting help during business hours was impossible. It also required the user to be very close to the sheep, which was difficult with some ewes. In talking with my friends at Emigh Livestock (also in Rio Vista), they suggested checking out a reader made by Gallagher. It would read the Shearwell tags, but they liked the user interface and wand-like construction better than the Shearwell reader. After seeing theirs in use, we went with the Gallagher HR5, at a cost of about $2,200. With the Shearwell tags and the Gallagher reader, we can automatically collect all of the data we've been collecting by hand – and then some. We can record all of the lambing data we need to make marketing and retention decisions. We can mark a ewe for culling – and get an alarm on the reader the next time she comes into the sorting chute. We can add visual ID tag numbers in case we lose an EID tag. We can link a ewe's ID to her lamb's. And when we're done with a working session, we can download all of this data into an Excel spreadsheet. The reader also connects via Bluetooth to our smart phones. Our new system will reduce both labor and the direct costs associated with ear tags and livestock identification. Because the Shearwell tags are smaller (and more likely to stay in) than our old scrapie tags, we'll use these tags at birth (instead of the brass lamb tags). We'll record ewe and lamb information with the reader, which will automatically populate our Excel spreadsheets. At this point, we can also mark a ewe to cull (which will give us an alarm every subsequent time we scan that ewe). Since the lambs will already have their permanent tag, we won't need to bring them in twice at weaning – we can wean and vaccinate all in one session. Using the reader, we can also automatically include withdrawal times for any treatments or vaccinations we administer, which will give us a warning if those animals are scanned again (at shipping, for example) – no more checking numbers against a written list (and no more clipboards in the corrals). Because we're using different colors for each breeding group, we'll still be able to sort into breeding groups visually (instead of having to scan ear tags). We'll collect individual body condition scores at weaning, flushing and breeding – allowing us to track and analyze the nutritional status individual ewes (as well as breeding groups). When we sell lambs to Superior Farms, we'll get detailed carcass data back on each lamb. Since we won't need someone dedicated to writing information at weaning, flushing and breeding, we can get by with less labor at these key times. But What About the Cost?! The cost of the entire system is significant. We could have decided to use the EID tags (simply to get carcass data) and not purchase the reader, but we think the reader will offer enough labor savings and additional data management benefit to justify the expense. Just to be certain, however, I have analyzed the investment in more detail, looking at both a simple payback period and the net present value of the investment. A simple payback period is calculated by dividing the initial investment by the net increase in revenue resulting from the purchase. The net present value analysis accounts for the time value of money – it is the difference between the present value of cash inflows and the present value of cash outflows over a period of time. The discount rate is used to reflect the potential for inflation or other risk to diminish the future value of that income stream. I estimate that the new system will save us over $500 in labor each year (less time at lambing and weaning – and less time generally tracking inventory). We'll also save a bit of money in ear tags (buying one tag instead of 3 for each animal). The net revenue increase per year, then, is around $606.50. I assume the reader will have a useful life of 15 years, with no salvage value (that is, nobody will want to buy it when we're done it it). Simple Payback Period ($2,200 ÷ $606.50) = 3.6 years. This means we can pay back this purchase in less than 4 years. Net Present Value (Discount Rate = 5%, 15 year useful life) = $2,098. This means the $2,200 investment we made this year will add nearly $2,100 to our bottom line in today's dollars over the lifetime of the reader! These analyses do not account for the improvements we should be able to make in carcass quality through better genetic selection, nor the ability to provide our customers with traceback opportunities. And I'm sure there are other management benefits I haven't considered! Investing in this technology today gives us new potential opportunities down the road, too. Flock management software, based on these EID tags, may give us even more savings and/or added revenue. In an ever tightening agricultural labor market, automated weighing and handling systems may allow us to continue to raise sheep with no outside labor. And I suspect there are new applications being developed! Even small-scale operations like ours should make decisions on management systems, equipment, and technology based on economics. The decision to implement an EID system, at this stage, seems economically sound. We'll continue to track the costs and benefits as we fully implement the system. All sheep and goats over 18 months of age must have a USDA-approved scrapie ear tag when they are sold. Most auction yards require scrapie tags regardless of the animal's age.